I am a veterinarian who mainly teaches in veterinary and comparative anatomy. I also teach in the Veterinary Professional Life program. I teach mostly veterinary anatomy and animal biology, but I also teach in the early stages of Murdoch’s innovative Veterinary Professional Life program. 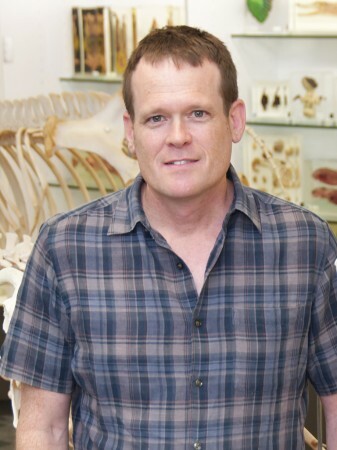 My research interests include veterinary education, comparative anatomy, and connective tissue biology (bone and cartilage, developmental and acquired orthopaedic disorders, pharmaceutical interventions in orthopaedic disorders). My most recent research has revolved around exploring professional competencies, employability, and resilience in the veterinary context. See www.vetset2go.edu.au (Twitter @VetSet2Go) for details of this 2.5-year collaborative project, which began in August 2015 and aims to define the capabilities most important for employability and success in the veterinary profession, and create online assessment tools and resources to build these capabilities. This Office of Learning and Teaching (Australia) funded study is a partnership between Murdoch University (lead institution), the University of Queensland, the University of Adelaide, the University of Sydney, the University of Edinburgh (UK) and the University of Nottingham (UK), and Washington State University (USA). 2015-current. Which is the most effective assessment tool to measure the ability to self-reflect and respond with insight? Melinda Bell (PhD) How can employability be defined in the veterinary context and how can it be assessed? Cake, M., McArthur, M., Matthew, S., Mansfield, C., (2017), Finding the Balance: Uncovering Resilience in the Veterinary Literature,	Journal of Veterinary Medical Education, 44, 1, pages 95 - 105. Miller, A., Cake, M., Warburton, N., (2016), The fibular meniscus of the kangaroo as an adaptation against external tibial rotation during saltatorial locomotion,	Journal of Anatomy: molecular, cellular and experimental morphology, 231, 6, pages 931 - 938. Cake, M., Bell, M., Williams, J., Brown, F., Dozier, M., Rhind, S., Baillie, S., (2016), Which professional (non-technical) competencies are most important to the success of graduate veterinarians? A Best Evidence Medical Education (BEME) systematic review: BEME Guide No. 38,	Medical Teacher, 38, 6, pages 550 - 563. Cake, M., Bell, M., Bickley, N., Bartram, D., (2015), The life of meaning: A model of the positive contributions to well-being from veterinary work,	Journal of Veterinary Medical Education, 42, 3, pages 184 - 193. Graff, J., Collins, A., Cake, M., (2015), FIRST DOCUMENTED AT SEA RECORDS OF INTERMEDIATE MORPH SOFT PLUMAGED PETREL PTERODROMA MOLLIS AND CLARIFICATION OF POLYMORPHISM IN THE SPECIES,	Marine Ornithology, 43, 2, pages 161 - 164. Poulet, B., de Souza, R., Kent, A., Saxon, L., Barker, O., Wilson, A., Cake, M., Pitsillides, A., (2015), Intermittent applied mechanical loading induces subchondral bone thickening that may be intensified locally by contiguous articular cartilage lesions,	Osteoarthritis and Cartilage, 23, 6, pages 940 - 948. Poinern, G., Brundavanam, R., Thi-Le, X., Nicholls, P., Cake, M., Fawcett, D., (2014), The synthesis, characterisation and in vivo study of a bioceramic for potential tissue regeneration applications,	Scientific Reports, 4, , pages 1 - 9. Cake, M., Read, R., Corfield, G., Daniel, A., Burkhardt, D., Smith, M., Little, C., (2013), Comparison of gait and pathology outcomes of three meniscal procedures for induction of knee osteoarthritis in sheep,	Osteoarthritis and Cartilage, 21, 1, pages 226 - 236. Chan, B., Fuller, E., Russell, A., Smith, S., Smith, M., Jackson, M., Cake, M., Read, R., Bateman, J., Sambrook, P., Little, C., (2011), Increased chondrocyte sclerostin may protect against cartilage degradation in osteoarthritis,	Osteoarthritis and Cartilage, 19, 7, pages 874 - 885. Little, C., Smith, M., Cake, M., Read, R., Murphy, M., Barry, F., (2010), The OARSI histopathology initiative - recommendations for histological assessments of osteoarthritis in sheep and goats,	Osteoarthritis and Cartilage, 18, SUPPL. 3, pages S80 - S92. Qian, Y., Lin, Z., Chen, J., Fan, Y., Davey, T., Cake, M., Day, R., Dai, K., Xu, J., Zheng, M., (2009), Natural bone collagen scaffold combined with autologous bone marrow cells for induction of osteogenesis in an ovine spinal fusion model,	Tissue Engineering Part A. Tissue Engineering, 15, 11, pages 3547 - 3558. Barron, A., Cake, M., Verdile, G., Martins, R., (2009), Ovariectomy and 17-estradiol replacement do not alter beta amyloid levels in sheep brain,	Endocrinology, 150, 7, pages 3228 - 3236. Melrose, J., Burkhardt, D., Taylor, T., Dillon, C., Read, R., Cake, M., Little, C., (2009), Calcification in the ovine intervertebral disc: A model of hydroxyapatite deposition disease,	European Spine Journal, 18, 4, pages 479 - 489. Cake, M., Read, R., Edwards, S., Smith, M., Burkhardt, D., Little, C., Ghosh, P., (2008), Changes in gait after bilateral meniscectomy in sheep: effect of two hyaluronan preparations,	Journal of orthopaedic science, 13, 6, pages 514 - 523. Cake, M., Read, R., Daniel, A., (2008), Vascular foramina of the metacarpophalangeal sesamoid bones of Greyhounds and their relationship to sesamoid disease,	American Journal of Veterinary Research, 69, 6, pages 716 - 721. Cake, M., Smith, M., Young, A., Smith, S., Ghosh, P., Read, R., (2008), Synovial pathology in an ovine model of osteoarthritis: effect of intraarticular hyaluronan (Hyalgan),	Clinical and Experimental Rheumatology, 26, 4, pages 561 - 567. Smith, M., Cake, M., Ghosh, P., Schiavinato, A., Read, R., Little, C., (2008), Significant synovial pathology in a meniscectomy model of osteoarthritis: modification by intra-articular hyaluronan therapy,	Rheumatology, 47, 8, pages 1172 - 1178. Pavlos, N., Cake, M., Wood, D., Xu, J., Zheng, M., (2008), Evidence that human cartilage and chondrocyte do not express calcitonin receptor,	Osteoarthritis and Cartilage, 16, 4, pages 450 - 457. Cake, M., Boyce, M., Gardner, G., Hopkins, D., Pethick, D., (2007), Genotype and gender effects on sheep limb bone growth and maturation: selection for loin depth causes bone hypotrophy,	Australian Journal of Experimental Agriculture, 47, 10, pages 1128 - 1130. Edwards, S., Cake, M., Spoelstra, G., Read, R., (2007), Biodistribution and Clearance of Intra-articular Liposomes in a Large Animal Model Using a Radiographic Marker,	Journal of Liposome Research, 3, 17, pages 249 - 261. Gardner, G., Hopkins, D., Greenwood, P., Cake, M., Boyce, M., Pethick, D., (2007), Sheep genotype, age and muscle type affect the expression of metabolic enzyme markers,	Australian Journal of Experimental Agriculture, 47, 10, pages 1180 - 1189. Gardner, G., Pethick, D., Hopkins, D., Hegarty, R., Cake, M., Boyce, M., Allingham, P., (2006), The impact of carcase estimated breeding values on yield and quality of sheep meat,	International Journal of Sheep and Wool Science., 54, , pages 33 - 39. Adams, N., Briegel, J., Pethick, D., Cake, M., (2006), Carcass and meat characteristics of sheep with an additional growth hormone gene,	Australian Journal of Agricultural Research, 57, , pages 1321 - 1325. Cake, M., Gardner, G., Boyce, M., Loader, D., Pethick, D., (2006), Forelimb bone growth and mineral maturation as potential indices of skeletal maturity in sheep.,	Australian Journal of Agricultural Research, 57, , pages 699 - 706. Cake, M., Gardner, G., Hegarty, R., Boyce, M., Pethick, D., (2006), Effect of nutritional restriction andsiregenotypeon forelimb bone growth and carcass composition in crossbred lambs,	Australian Journal of Agricultural Research, 57, , pages 605 - 616. Cake, M., (2006), Deep dissection: Motivating students beyond rote learning in veterinary anatomy,	Journal of Veterinary Medical Education, 33, 2, pages 266 - 271. Young, A., McLennan, S., Smith, M., Smith, S., Cake, M., Read, R., Melrose, J., Sonnabend, D., Flannery, C., Little, C., (2006), Proteoglycan 4 downregulation in a sheep meniscectomy model of early osteoarthritis,	Arthritis Research and Therapy, 8, 2, pages 41 - 47. Augusteyn, R., Cake, M., (2005), Post-mortem water uptake by sheep lenses left in situ,	Molecular Vision, 11, , pages 749 - 751. Melrose, J., Smith, S., Cake, M., Read, R., Whitelock, J., (2005), Perlecan displays variable spatial and temporal immunolocalisation patterns in the articular and growth plate cartilages of the ovine stifle joint,	Histochemistry and Cell Biology, 123, 6, pages 561 - 571. Melrose, J., Smith, S., Cake, M., Read, R., Whitelock, J., (2005), Comparative spatial and temporal localisation of perlecan, aggrecan and type I, II, and IV collagen in the ovine meniscus: an ageing study,	Histochemistry and Cell Biology, 124, , pages 225 - 235. Cake, M., Appleyard, R., Read, R., Smith, M., Murrell, G., Ghosh, P., (2005), Ovariectomy alters the structural and biomechanical properties of ovine femoro-tibial articular cartilage and increases cartilage iNOS,	Osteoarthritis and Cartilage, 13, 12, pages 1066 - 1074. Young, A., Smith, M., Smith, S., Cake, M., Ghosh, P., Read, R., Melrose, J., Sonnabend, D., Roughley, P., Little, C., (2005), Regional assessment of articular cartilage gene expression and small proteoglycan metabolism in an animal model of osteoarthritis,	Arthritis Research and Therapy, 7, 4, pages 852 - 861. Cake, M., Read, R., Appleyard, R., Hwa, S., Ghosh, P., (2004), The nitric oxide donor glyceryl trinitrate increases subchondral bone sclerosis and cartilage degeneration following ovine meniscectomy,	Osteoarthritis and Cartilage, 12, 12, pages 974 - 981. Appleyard, R., Burkhardt, D., Ghosh, P., Read, R., Cake, M., Swain, M., Murrell, G., (2003), Topographical analysis of the structural, biochemical and dynamic biomechanical properties of cartilage in an ovine model of osteoarthritis,	Osteoarthritis and Cartilage, 11, , pages 65 - 77. Cake, M., Appleyard, R., Read, R., Ghosh, P., Swain, M., Murrell, G., (2003), Topical administration of the nitric oxide donor glyceryl trinitrate modifies the structural and biomechanical properties of ovine articular cartilage,	Osteoarthritis and Cartilage, 11, , pages 872 - 878.